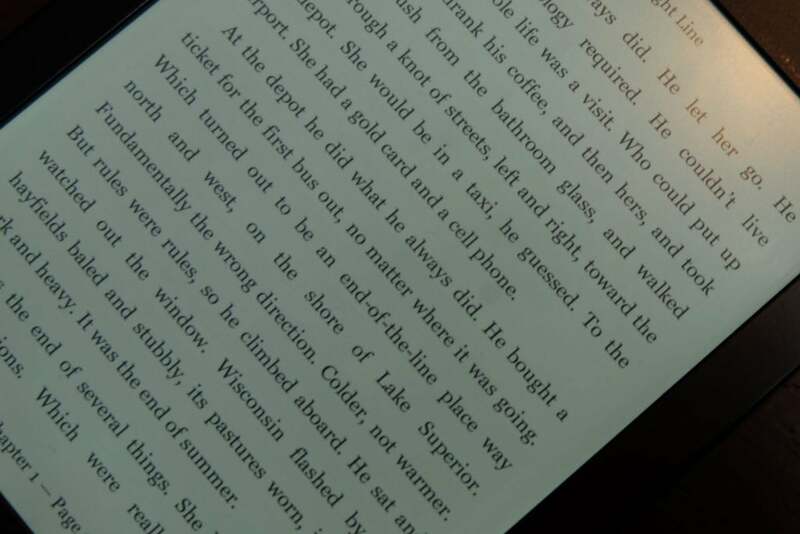 What is the Kobo Clara HD? Amazon’s position of dominance at the top of the e-reader market is clear to see. But a few competitors remain, churning out devices that they hope will compete with the Kindle Paperwhite, Oasis and Voyage. The Kobo Clara HD costs the same as the Kindle Paperwhite, which instantly makes it a tough sell. However, its compact build does warrant investigation. While pricier e-readers, such as the Kindle’s £249 Oasis, have attempted to be a little more exciting with their designs, the majority have stuck to a fairly generic blueprint. The Kobo Clara HD rarely strays from the predictable – except in areas it probably shouldn’t. This is a fairly standard black plastic rectangle, with a micro-USB port for power and a squishy power button flanking it. The screen is recessed into the body and there’s a distinct lack of page-turning buttons. On the front, the design is about as generic as you can get. Flip it over, however, and you’ll see exactly why Kobo shouldn’t have veered from the ‘safe’. The rear is a weird textured plastic that both looks and feels horrible. It becomes greasy and sweaty on being held for long periods, plus the pattern itself is just odd. 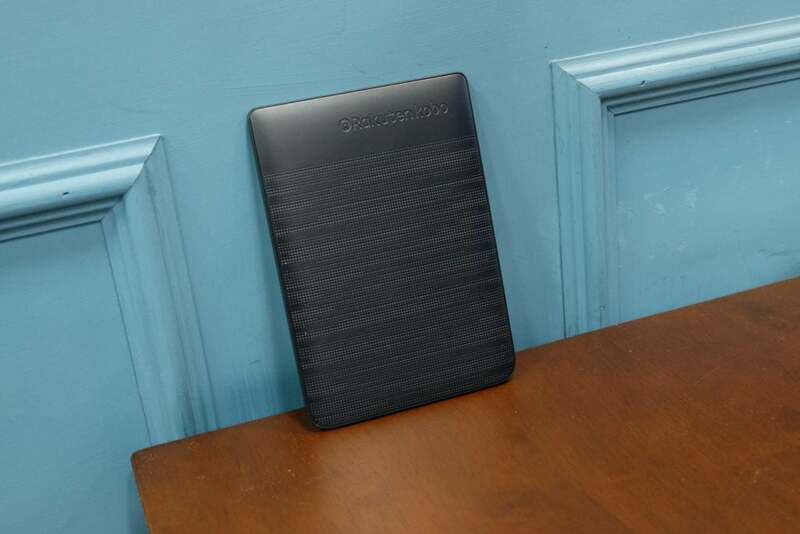 It lacks the grip and durability of the rubbery matte plastic of the Paperwhite, or even the cheaper Kindle, and feels like it would pop off if the device were accidentally dropped onto the floor. The Clara HD also lacks any sort of waterproofing, which until the latest generation of the Kindle Oasis was one of Kobo’s unique features. Add an IP rating here and it would instantly offer something that the similarly priced Kindles are lacking. What the Clara HD does have over the Paperwhite is its size. This is one of the most compact e-readers around, and it’s dinky enough to comfortably slip inside my coat pocket. It’s about as tall as a Samsung Galaxy S9 phone, only a lot wider, and it’s super-light at just 166g. I could comfortably hold the device one-handed for a two-hour train journey – something that isn’t so easy to do with the bulkier Kindle. The design of the Kobo Clara HD might be strange, but at least the screen is a pleasure to read on. The 300ppi, 6-inch Carta E Ink screen matches the Kindle Paperwhite for specs and for quality too. Text looks crisp, and since this is an E Ink display, there’s no risk of suffering eye-strain like you do if reading for hours on an LCD. However, the fact that it’s an E Ink panel also means it isn’t naturally backlit. Instead, it features a front-light system that brightens the display and makes it possible to read in the dark. The lighting system in the Clara HD is good – it’s evenly spread across the display and can go both really light and really dark. 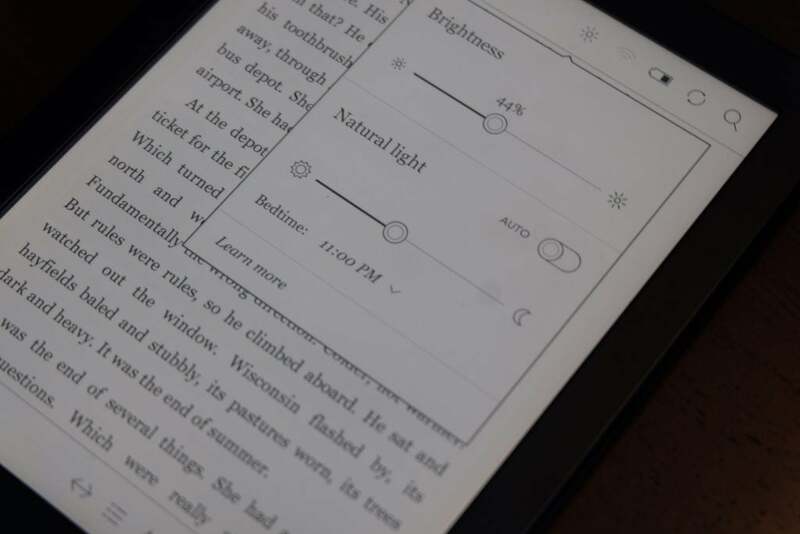 There’s no auto-brightness, so you’ll have to alter that manually, but this isn’t a feature you’d normally expect on an e-reader at this price. One useful addition is the ‘Natural Light’ setting. This turns the screen an orange hue to make it even easier to read at night. The orange colour is supposed to be better and kinder on the eyes right before bedtime – and I think it does make a big difference. You can customise the intensity of the colour and even schedule it to automatically come on every night. Kobo’s software is the same across its entire e-reader lineup, and there are bits I like and others that I don’t. Take Pocket integration, for example. Having access to the fantastic read-it-later service on an e-reader means I can easily save online articles from Chrome on my MacBook in the knowledge that they’ll be waiting for me to read on my commute. I also appreciate that I can easily load EPUB files onto the Clara HD without faffing with PC software. Not only does this mean you’re not restricted to buying books only from Kobo, but it allows access to library rental schemes too. This just isn’t easily possible with the locked-down Kindle. Overall, the UI is fairly straightforward. Navigating around the store and organising your books into collections is easy and intuitive. There are 11 fonts to choose from, all with size options, and handy extras such as a built-in dictionary and social network sharing. It’s just a shame then that navigating the interface can often be slow and plodding, especially when you’re trying to tap some of the incredible tiny action buttons. Multiple times I was trying to enter the Natural Light mode and it just wouldn’t register my press, no matter how hard I tried. You’ll also have to live with the fact that Kobo’s store just can’t match Amazon’s for quality. Of course, you’ll have access to all the bestsellers, but I found Kobo didn’t offer anywhere near the number that Amazon does, plus you’re missing all those Kindle exclusives by smaller authors. There’s also nothing similar to Prime Reading or Kindle Unlimited – two features that tend to encourage me to read a lot more when I have a Kindle. There’s no 4G/3G option with the Clara HD, so you’re stuck with Wi-Fi. Downloading books was pretty swift, though, and you can of course plug the device into your computer and transfer files that way. Battery life is always hard to judge on an e-reader, mostly because it can vary widely depending on how much you read. During my week with the device, which involved about 45 minutes of reading a day, the battery went down from 50% to 20%. That seems to correlate with Kobo’s claim that you’ll get weeks without needing to charge. Why buy the Kobo Clara HD? It isn’t flashy or exciting, and nor does it do anything particularly new. However, the compact build of the Kobo Clara HD means it isn’t completely without merit. It seems slightly overpriced at £109.99 and I’d recommend the Kindle Paperwhite over it. The Clara HD is for those who really don’t want to be locked into the Amazon ecosystem; personally, this isn’t an issue for me. The post Kobo Clara HD appeared first on Trusted Reviews.